← Chachapoyas: As fun to say as it is to visit! When leaving Ecuador, we picked mountains over beach by deciding to go to Chachapoyas instead of Mancora (hmm, sounds like when we chose to move to Colorado from Hawaii). We were craving some time relaxing in the sand, sun, and surf, so we took a night bus across Peru to the coast. 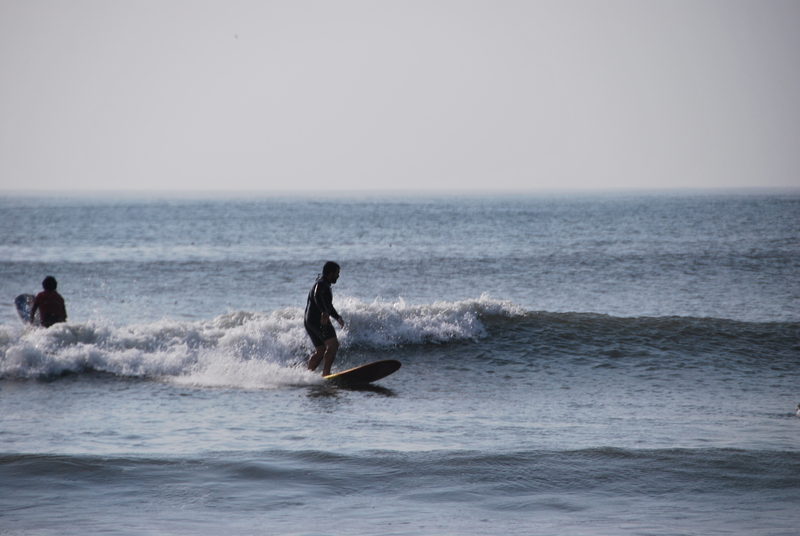 We decided to venture off the beaten path and try out a little surf town called Pacasmayo. We arrived early in the morning and checked in to the first hostel we found. Unfortunately, Joe wasn’t feeling too well, so he spent the morning relaxing in the room while Kristen explored the town. It turns out there wasn’t too much to see, and the beach wasn’t too great to relax on because it was all rocky. 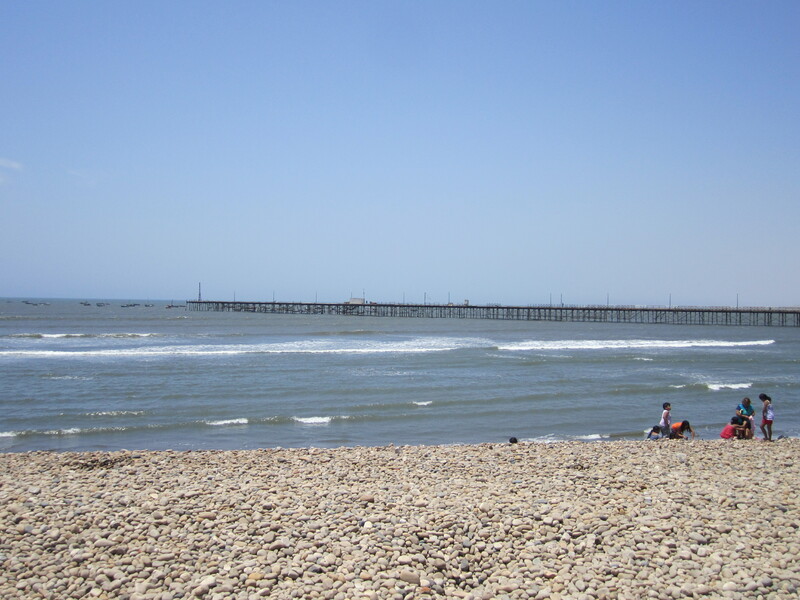 However, Kristen spent some time just sitting in the sun and watching the Peruvian tourists enjoy time on the coast. Fortunately after our magic concoction of rest, Sprite, and saltines, Joe felt well enough to join Kristen in exploring the small town. 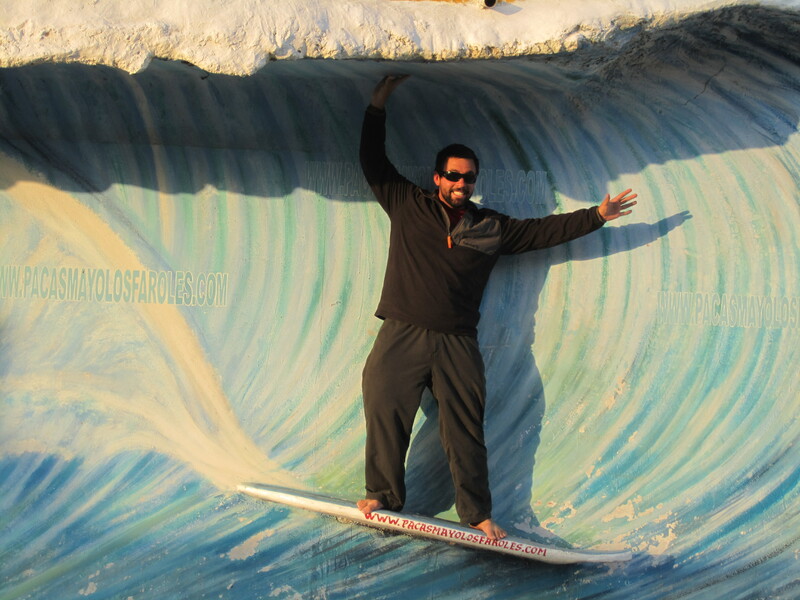 Although the swell wasn’t the greatest, Joe still managed to hang ten. We walked along the beachfront street for a bit before checking out the historic pier. 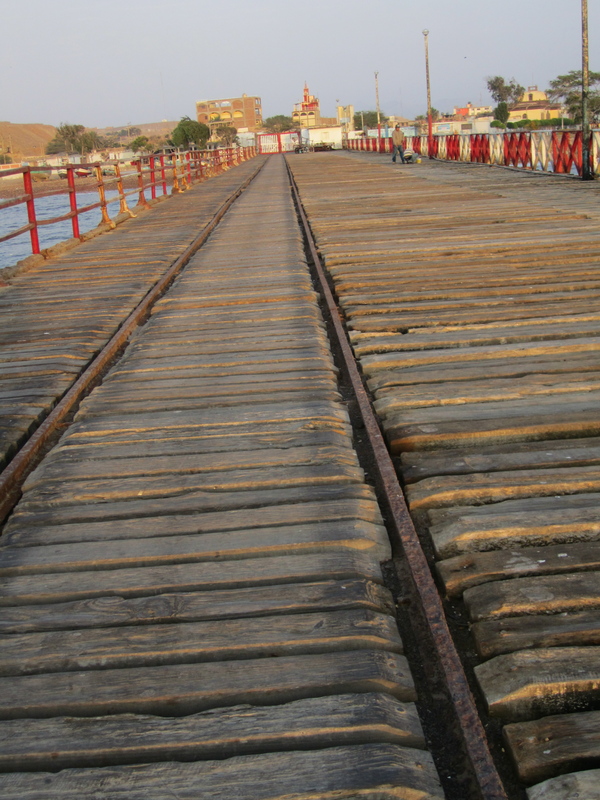 Once you started walking on it, you knew that it must be pretty old because some boards were missing and others felt a little wobbly. I guess that’s what happens after 135 years. It was pretty scary walking out to the end because you had to carefully watch each step and the pier was extremely long. We walked all 773 meters out to the end and watched a few local fishermen try their luck. 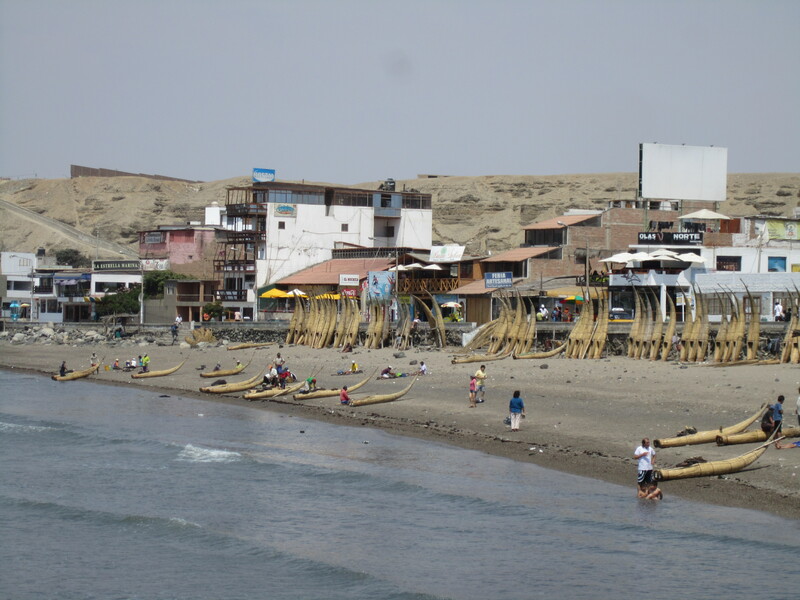 Since we had basically seen everything in Pacasmayo and there wasn’t a nice beach to relax on, we decided to head two hours south to Huanchaco. 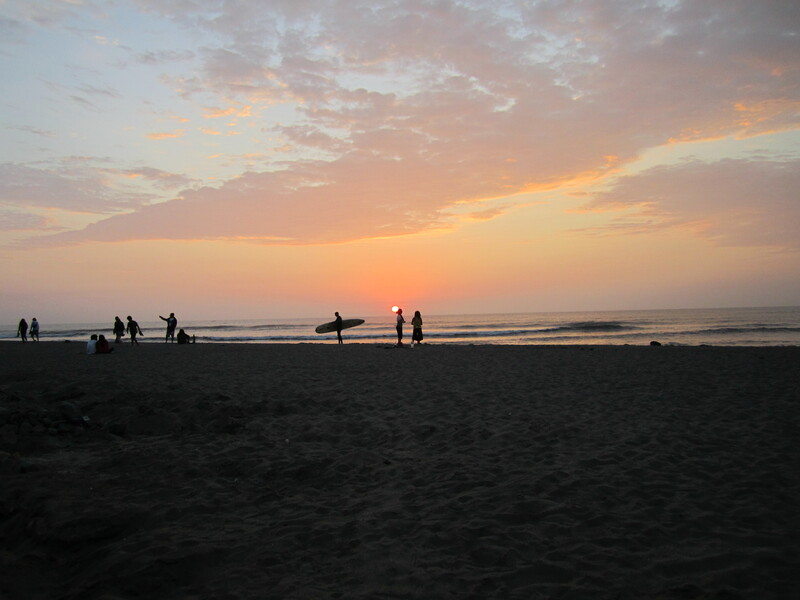 Huanchaco is a nice little surf town. We had a great hostel that checked all the boxes: hot shower, great internet, our own bathroom, window, comfortable bed, and friendly hosts. It was also our cheapest hotel of the trip- a whopping $11 per night. 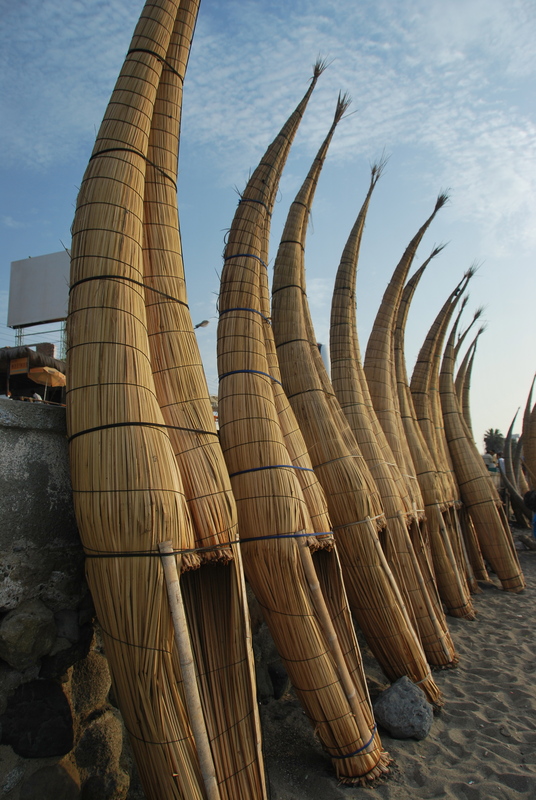 Huanchaco is famous in Peru because fishermen here still use the traditional boats made out of reeds, called caballitos. These are the same type of boats that you can see on their ancient pottery. We spent quite a few hours watching the fishermen hard at work: fixing nets, preparing bait, or paddling out. 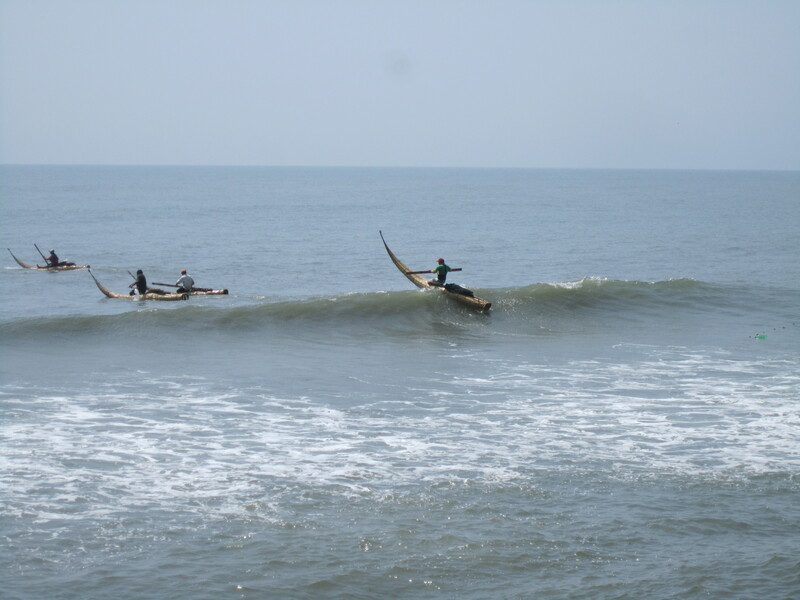 Our main objectives while in Huanchaco were to surf, relax at the beach, and eat as much seafood as humanly possible. We easily accomplished all three. Joe rented a board and caught some nice rides while Kristen enjoyed staying dry and warm in the sand. Joe catching a real wave this time. We spent some time laying in the sand, reading or catching a short snooze. We made sure to enjoy the sunsets every evening. We really geared up for the eating portion. The food in Peru is definitely a big improvement from Ecuador. Every restaurant here seemed to specialize in seafood and we were happy to patronize them. Some of the meal deals were ridiculously cheap and still very tasty. 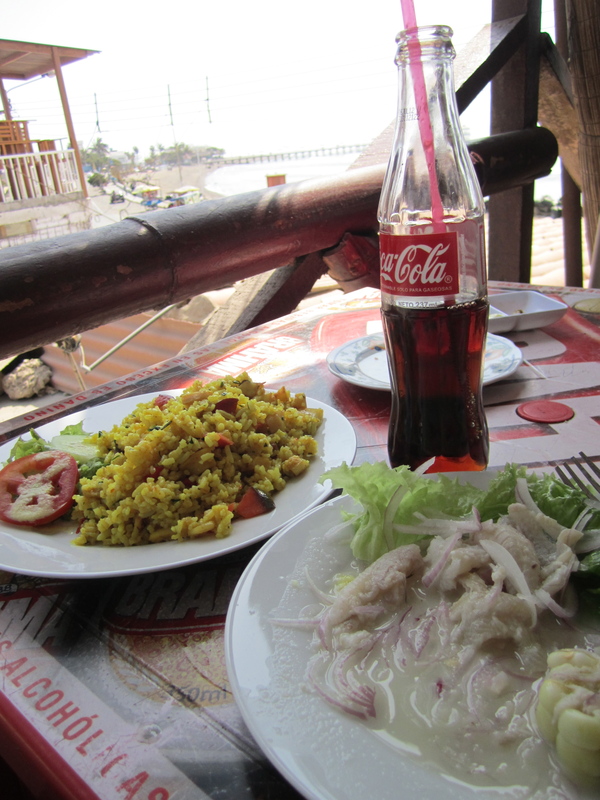 Ceviche, Rice with Seafood, and a Coke- How is this less than $4? Oh, and a beach view! Okay, so it wasn’t all beaches and seafood, as we decided to experience some culture as well. 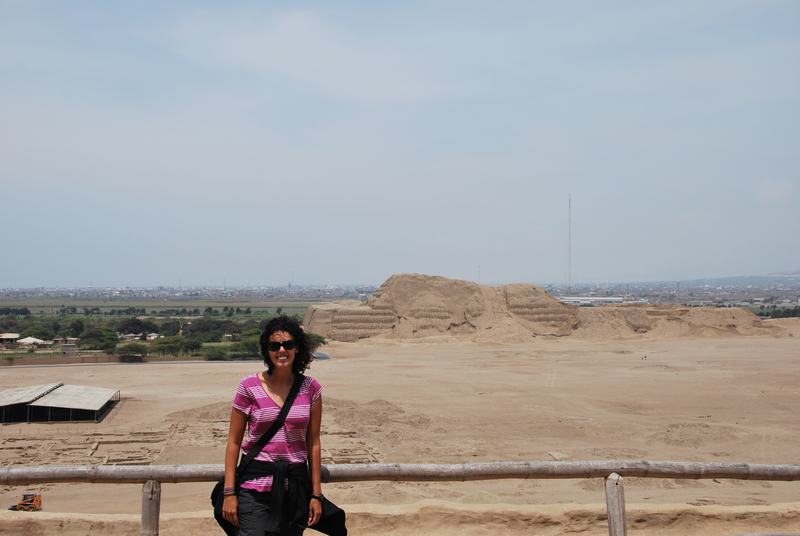 While Peru seems to have a different set of ruins on every corner, we had heard that the Haucas del Sol y Luna (Temples of the Sun and Moon) were interesting enough to warrant a visit. We took a bus through the loudest streets (people here honk more times in ten minutes than we do all year) to Trujillo and then took a cab to the temples. 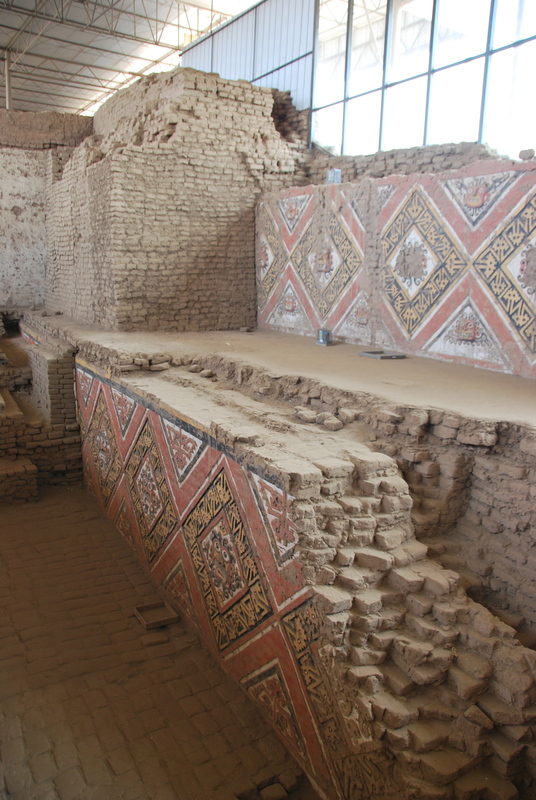 We started out by exploring the museum which contained a bit of information about Moche people who once inhabited this area and it also held some of their amazing pottery. Now, we are not big museum people, but we could have looked at this pottery all day long because it was so incredible. Maybe it’s because we took a ceramics class and could barely make a usable bowl, but these items were so intricate and beautiful that we think that anyone would be impressed by them. Unfortunately, we were not allowed to take pictures and they were pretty strict about that. 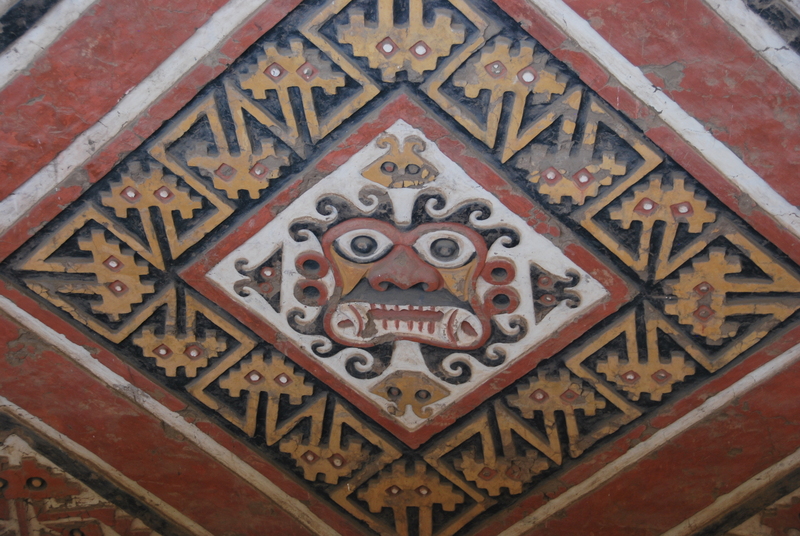 Hopefully we’ll get some when we see more Moche pottery while in Lima. Then we walked across the open desert to the Temple of the Moon. (Did I mention that all of Peru’s coastline seems to be just dunes and desert? It’s a little strange and not necessarily the most attractive.) Along the way, we passed one of the strange Peruvian Hairless dogs, a very weird-looking animal indeed. Like all the ruins in this part of Peru, these two temples and the city in between them were built with adobe bricks, so it is amazing that anything is still standing after 1,500 years of wind and rain. They don’t look too impressive from afar (more like massive mounds of dirt), but when we explored The Temple of the Moon more closely we were amazed at what we found. 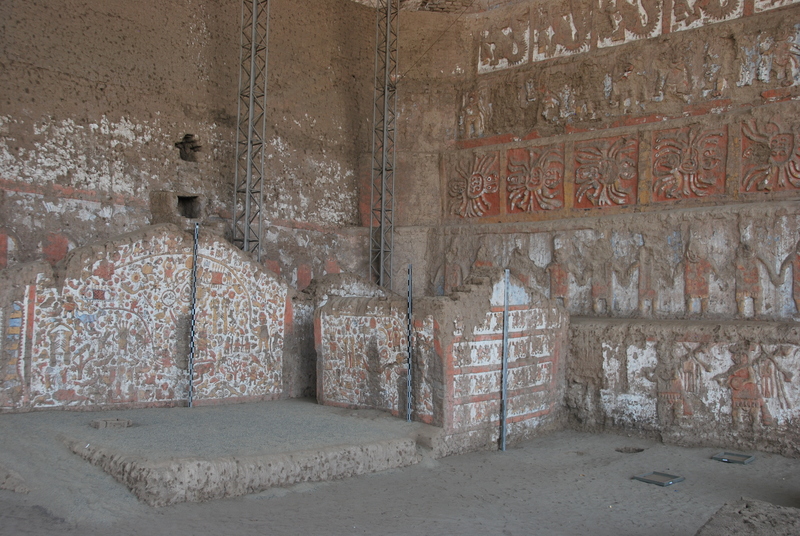 They pyramid structure of the Temple of the Moon was rebuilt several times throughout the Moche period. Each time it was rebuilt, they completely covered the previous pyramid. They have excavated several parts to show the different layers and give a glimpse at what each temple looked like. The artwork is just stunning, which I guess shouldn’t be a surprise after seeing some of their beautiful pottery in the museum. The colors and designs were beautiful. Our guide also informed us that all the designs were done freehand, so they all look a little different. I am glad it wasn't my job to create this. I would have never been able to do it without a stencil. As we walked around the temple, we got glimpses at different levels of the temple along the way. We were pretty impressed, and then tour guide took us to what was the main attraction- one of the outside walls of the temple had been completely uncovered. It was huge and beautiful. Even though looters had broken in to the temple at one point (the big crack above Joe’s head), the wall was in pretty good shape. Considering this thing is basically all mud, we couldn't believe how well-preserved it actually was. We loved looking at all the designs found on the walls. 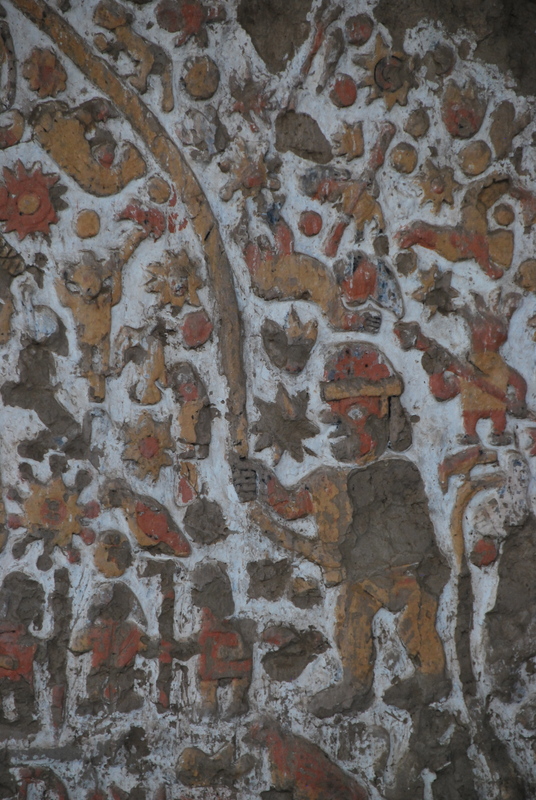 Every painting is so intricate. 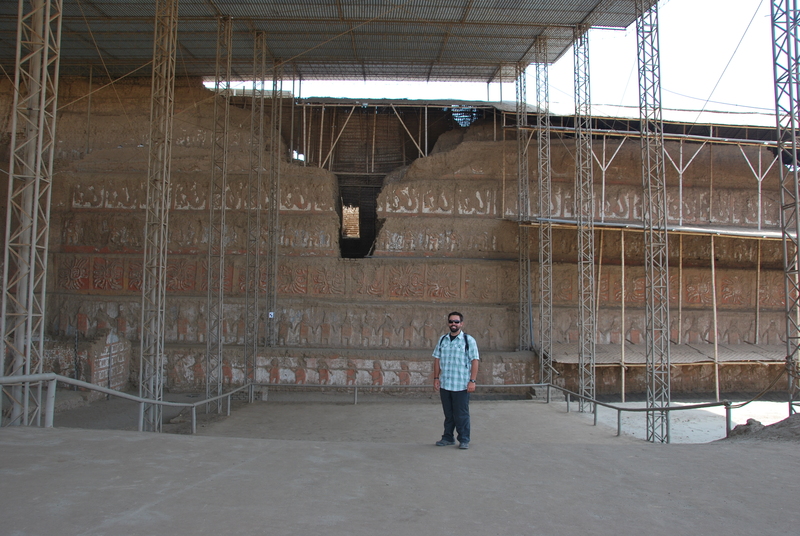 People were still working on excavating this temple, so who knows what more they might find! They haven’t even begun to excavate the Temple of the Sun (they need more money), so maybe they will find more treasures there. All in all, a very worthwhile stop. 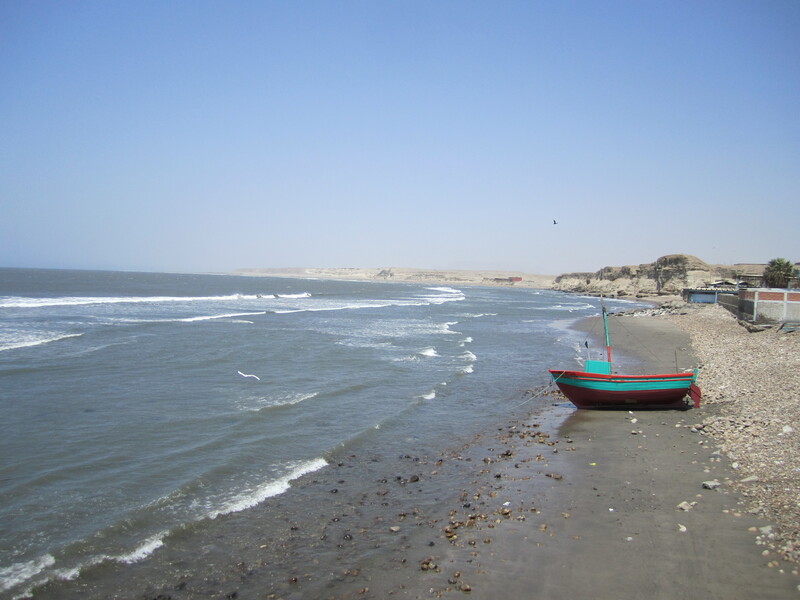 We really enjoyed our time on the Peruvian coast because it gave us a chance just to relax and recharge our batteries. While Huanchaco was nice and quiet while we visited, judging by the large number of hostels, that may be different story in a few weeks when the busy season (and surf) picks up. So enjoying reading about your trip! Thank you for these wonderful trip reports….you keep giving me wonderful ideas for future trips. And for now, I can continue to ‘armchair’ travel with you! I think I just heard the theme for the Endless Summer play in my mind as I read this post. Food, surfing, exploring… yup, your life ROCKS.